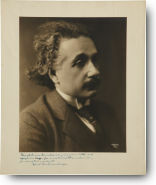 LOS ANGELES — A trio of intriguing lots related to the father of modern physics, Albert Einstein, from three distinct and important periods of his life, will provide a fascinating survey of one of the great geniuses of all-time when they come up for public auction as part of Heritage Galleries Beverly Hills’ Feb. 11-12 Rare Books and Historical Manuscripts & Autographs Auctions. DALLAS, TX — An awed hush fell over the Platinum Night bidding floor of Heritage Auctions’ Orlando FL FUN U.S. Coin Auction on Thursday, Jan. 7, as “The Olsen Specimen” 1913 Liberty Nickel, PR 64 NGC, lived up to its billing as the most famous American coin by bringing a jaw-dropping $3,737,500. 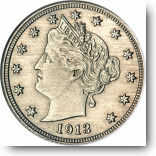 This figure is tied for the third-largest sum ever paid at auction for a single U.S. coin. 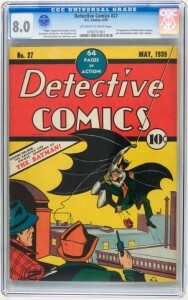 It will, more than likely, become the single most valuable comic ever offered at public auction. Though it’s being sold with no reserve and no minimum bid, it’s expected to bring at least $300,000. The current record for a comic sold at auction stands at $317,000, for a copy of Action Comics #1, sold last year at another auction house. The other question the auction will settle, at least for the time being, is one of the great debates of Pop Culture: Who is worth more today, Batman or Superman? The third-party certification service CGC has graded the comic Very Fine 8.0, a grade that only one other copy of this issue has reached and none has surpassed. Heritage has not disclosed the source of the comic other than to note it comes from a savvy collector who assembled his collection in the 1960s and 1970s. To say that today’s hordes of comic collectors, Batman fans and Pop Culture devotees are envious of a comic such as this, bought for a mere fraction of what the current price will be, is an easy understatement. By late February the top collectors in the world will be eyeing this book closely, and weighing just how much it’s worth to them to have the have the holy grail of comic books, and to be part of history. FALLS CHURCH, Va. – A map that was purchased for $10 at a northern Virginia estate sale has guided its owner to a profitable destination at auction, where it sold to an anonymous bidder for $23,400. The 1827 map of the State of Virginia, drawn by Herman Boye and engraved by H.S. Tanner and E.B. Dawson, had been tucked inside a box of 10 assorted books and offered at an estate sale for a group price of $10. The buyer, a Virginia attorney who dabbles in books, suspected the map might be valuable and took it to Quinn’s & Waverly Auction Galleries in Falls Church, where experts entered it in a Dec. 3 sale with an estimate of $2,500-$4,000. Comprised of 40 sections, the map is one of only 800 printed for distribution to Virginia’s state senators in 1827, with each map representing one of nine geographic regions. The auctioned map depicts the state before the territorial split that resulted in the formation of a new state, West Virginia, and does not include Arlington County, which was still part of Washington, D.C. at the time of the map’s publication. Based on an inscription inside the cover of its slipcase, the map was originally the property of John Randolph (1773-1833) of Roanoke, Va., who served seven terms in the Virginia House of Representatives. 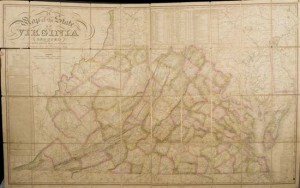 Linen-backed and hand-colored, the map details the rivers, roads, towns, county seats, ferries and other natural and man-made points of interest of northwestern Virginia in the 1820s. A population table provides data from the first four U.S. Censuses and lists the number of whites, slaves and free blacks then living in Virginia. Its statistics indicate that at the time of the map’s publication, there were 36,889 freed blacks in the state – less than 10 percent of the number of slaves – out of a total population of 1,065,366 people. For Patrizzi & Co’s final auction of the 2009 calendar year, the watch auction house focussed on collector-level timepieces with just 93 lots. Buyers responded positively, with sales particularly strong for Patek Philippe and two exceptional Art Déco clocks. 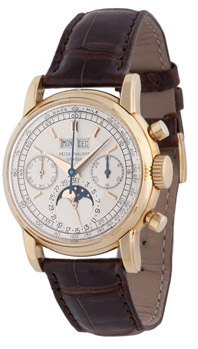 The auction totalled $4,225,300 with Patek Philippe accounting for more than half the total value. Including this sale, Patrizzi & Co has finished the year with sales over $34m from a total of eight auctions in New York, Geneva and Milan. Highlights in New York included two Patek Philippe 18k yellow gold round-button chronographs, Ref. 2499; the model from the rarer Second Series was the top seller of the auction, achieving $720,000, while the other sold for $320,000. Art Déco clocks created for Black, Starr & Frost, attributed to newly discovered designer Pierre Gravoin, sold for $380,000 and $340,000. American baseball player Lenny Dykstra’s 18k white gold Patek Philippe Annual Calendar on a matching gold bracelet sold for $28,000. “Bidders definitely raised their prices because of our policy of no buyer’s commission,” said Osvaldo Patrizzi, chairman and CEO of Patrizzi & Co, in a statement. “We had many active bidders over the phone and online, particularly from Hong Kong, China, Russia, Italy and the US. The clocks made by Black, Starr & Frost are two of the finest examples of Art Deco clocks reflecting a culmination of jewelry, art, design and technology of their time. “In addition, the six sets of watch keys sold for more than double their estimate, with three of the six lots selling for more than triple their estimation,” he said. About 80 people attended the auction with another 100 people bidding by Internet, and 60 by phone and absentee bid, with most bids coming from China, Italy, and Hong Kong. Over 66% of the 93 lots sold. In addition to the live and online auction, Patrizzi & Co hosted its first New York silent sale over four days. Timepieces sold from $500 to $25,000, including Patek Philippe, Audemars Piguet, A. Lange & Sohne, Heuer, and pocket watches by Jules Jurgensen and Ekegren, among others. The new SMS system to notify bidders of competing bids created a lively atmosphere with potential buyers waiting in the showroom with cell phones in hand while watching the results on the computer screen. However, Patek Philippe seems to create a lively atmosphere at auction, regardless of the technology involved. Earlier this month, the Ref. 3974 sold for a record $1.2m alongside a host of other rare fine watches at the final Antiquorum sale of 2009, also in New York. NEW YORK — The single most substantial collection of Canadian Coins ever offered at public auction, accompanied by what is almost certainly the most famous South American coin of all time, will headline Heritage Auctions’ Jan. 3-4 Signature® World Coin Auction, held in conjunction with the New York International Numismatic Convention (NYINC), at the Waldorf Astoria Hotel in New York City. 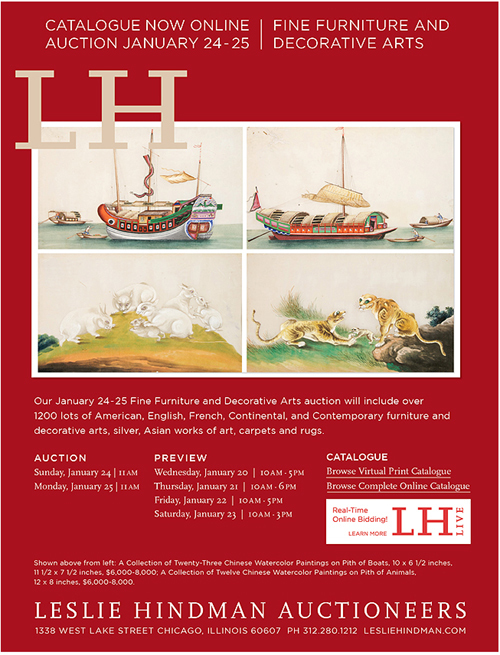 Bidding will take place live at the auction and online (www.HA.com). 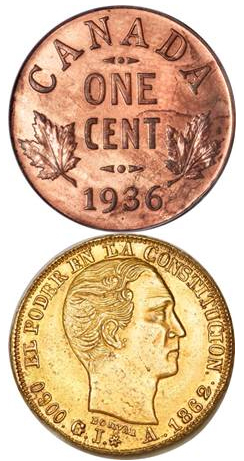 The main attraction of the Heritage Auctions’ NYINC event is The Canadiana Collection, the finest collection of Canadian coins ever assembled, the sale of which will change the face of the Canadian numismatic market as a host of coins that have not seen the open market in years make their way back into the general coin collecting populace. With the offering of this 1936 Dot Cent, Heritage Auctions will have brought to auction all three examples of the 1936 Dot Cent that exist outside of museum collections. As a Specimen 66, this piece is five grade points finer than the Dominion Collection Specimen offered in September 2006 and two points finer than the Pittman-Belzberg Specimen sold in January 2003. At its previous appearance in the Belzberg Collection, auctioned by Heritage in January 2003, this issue of the 1921 George V 50 Cents “King of Canadian Coins,” Ex: Bass-Belzberg-Brown example, was graded MS65 by PCGS and also MS65 by ICCS; it has since been upgraded to MS 66. One of the very scarce survivors of this important issue, this example was certainly well-kept from the time it was acquired and should draw quite a bit of attention from collectors. Further highlights of The Canadiana Collection include an 1890-H 50 Cent in MS64, the rarest coin to find of the incredibly difficult Victoria 50 Cents series, and certainly one of Canadian numismatics’ most coveted issues (estimated at $175,000-$225,000) and an 1870 No LCW 50 Cents, MS64 PCGS, the finest known example of this extreme rarity by four points, estimated at $150,000-$200,000. Collectors of all numismatic nationalities will most certainly be keeping a close eye on the undeniably unique 1862 Republic gold 50 Francos 1862-GJ, KM-Pn10, AU55 NGC from Ecuador, probably the most important South American coin that exists. It carries an estimate of $400,000-$500,000. The Exeter College Collection of British Coins, an outstanding group of about 250 silver British coins, most of them in high mint state condition, will offer a major draw to collectors of fine English numismatics, while the reach of the British Empire will also be felt as Heritage auctions The Bombay Collection of Indian Gold Coins, consisting of 78 gold coins from India, including four rare and highly sought after William III Double Mohurs. Republic gold 20 Pesos 1916, KM21, Proof 63 PCGS: Extremely rare Proof only date with a total mintage of 10 pieces. One of the great rarities of the Latin gold series, and missing in the collections of the ANS and Smithsonian, Estimated at $100,000-$125,000. George V Proof Set 1934, KM-PS11, comprising KM22-27, certified and graded by PCGS as follows: Halfpenny Proof 65 RB; Penny Proof 65 RB; Threepence Proof 68; Sixpence Proof 67; Shilling Proof 67; and Florin-Two Shillings Proof 66. An absolutely spectacular set, possibly the finest known and certainly the highest certified. Very rare and a centerpiece for any advanced collection of Australia. Possibly the finest of the very few proof sets known. Estimated at $60,000-$75,000. Mughal Empire. Muhammad Jahangir gold Zodiac Mohur AH1028 Year 14 (1619) Virgo, KM180.11, Friedberg 767, AU55 NGC: One of the most classic and desired series in all numismatics, and Virgo is perhaps the rarest of all the Signs of the Zodiac in gold. Estimated at $60,000-$75,000. La Rioja Gold 8 Escudos 1842-R, KM14, Friedberg 10, XF40 NGC: A coin of great historical importance, it was struck under the authority of General Juan Manuel de Rosas, leader of the Argentine Confederation. Extremely rare and one of the most historically compelling issues of the Argentine series. Estimated at $55,000-$65,000. South African Republic gold Pond 1874, Friedberg 1a, KM12, MS64 NGC, fine beard variety: An astounding example of the famed Burgers Pond, portrait of President Thomas François Burgers. 695 were struck in Birmingham, England. Few of this small number have survived, and many extant are damaged from jewelry use; certainly one of the highlights of the entire auction. Estimated at $50,000-$60,000. Breslau Karl Ferdinand of Poland gold 10 Ducats 1639, Facing bust with date below/Two shields, with scepter and sword behind, eye of God above, F-503a, struck with dies for the 1639 Taler Dav-5114, 44 mm, 34.59-C gm, XF40 NGC: An exceedingly rare coin, one for which Heritge can find no previous record of sale. Estimated at $40,000-$50,000. Paul I Albertus Russian Rouble 1796 БM, Crowned Imperial eagle with date above/Tablet with legend, Bit-14 (R1), UZD-1257, AU details with collector’s mark Λ below the eagle’s tail: Estimated at $20,000-$25,000. Ligurian Republic – Genoa 4 Lire 1804 Anno VII, KM265, MS66 NGC: Estimated at $10,000-$12,500. Vittorio Emanuele III PROVA Set 1939R, the six coin series certified and graded by NGC as follows: 5 Centesimi KM-Pr68 aluminum-bronze, MS63; 10 Centesimi KM-Pr69-C aluminum bronze, MS63; 20 Centesimi KM-Pr70 non-magnetic, MS63; 50 Centesimi KM-Pr71 non-magnetic, MS64; Lira KM-Pr72 non-magnetic, MS64; and 2 Lire KM-Pr73 magnetic, MS62. Each coin has PROVA added to the reverse legends. Estimate: $7,500-$10,000. Ligurian Republic – Genoa 2 Lire 1798 Anno 1, KM264, MS65 NGC: Estimated at $6,000-$7,500. A near complete date run of Russian platinum 3 Roubles including proof coins. Heritage Auctions, headed by Steve Ivy, Jim Halperin and Greg Rohan, is the world’s third largest auction house, with annual sales more than $700 million, and 475,000+ registered online bidder members. For more information about Heritage Auctions, and to join and gain access to a complete record of prices realized, along with full-color, enlargeable photos of each lot, please visit www.HA.com. Cowan’s Winter American History auction held December 9, 2009 brought in over $650,000 on 400 lots. Exceeding its pre-auction estimate of $8/10,000, an Album of Carte de Visite Photographs of Abraham Lincoln’s Funeral Procession sold for $27,025. The album, containing 97 CDVs, featured images from three of the nine cities in the funeral procession route. The album also contains a rare image of Lincoln’s bedroom in Springfield, IL. A rare quarter plate daguerreotype of Seneca Chief Governor Blacksnake realized $22,325. An influential leader, he was involved in one of the great events in Seneca history, the formation of the Code of Handsome Lake. The code incorpotated elements of Christianity and traditional Iroquois culture. A collection of Plains Indian Photographs by Julia Tuell brought $21,150. Tuell lived in Lame Deer, Montana, where she was a keen observer of Northern Cheyenne daily life. Images include photos of the Cheyenne Sun Dance and Animal Dance. An Archive of the California Gold Rush sold for $11,750. The archive features 175 items, which includes documents and manuscripts that provide a glimpse into the lives of Americans during the late antebellum years.